Though visible from Oahu’s western shores, lush Kauai feels like it’s a world away. The Garden Isle’s gravity-defying Na Pali Coast, excellent snorkeling, surfer towns, and rainforest interior are well worth a day away from urban Honolulu. Here’s what you need to know about full-day Kauai tours from Oahu. Easily accessible from Oahu, Kauai is an ideal choice for a day trip or weekend break from the bustle of Honolulu and Waikiki. 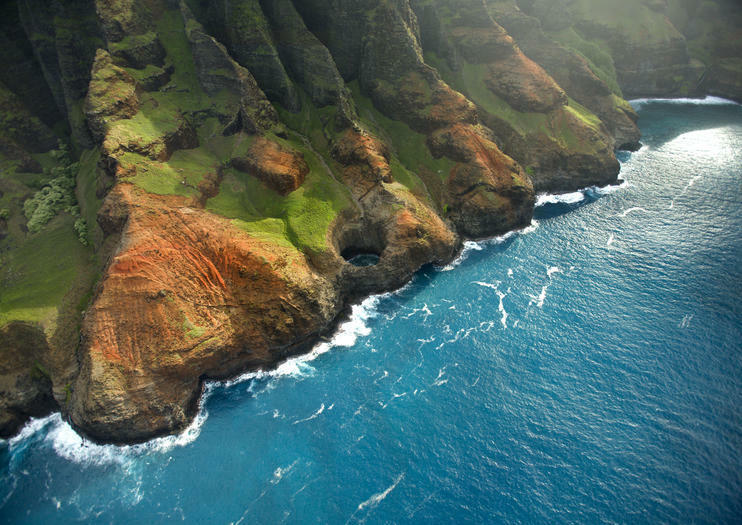 Choose between interisland tours by plane and minibus, or helicopter tours that swoop in close to Kauai’s dramatic scenery. Some helicopter tours also include land-based portions. All Kauai tours include round-trip airfare between Honolulu and Lihue. Tours offer varied itineraries. All visit Kauai’s scenic Na Pali Coast and offer chances to gaze 3,000 feet (914 meters) down into Waimea Canyon, the Grand Canyon of the Pacific. Some visit sites such as quaint Old Koloa Town, Waimea (Captain Cook’s first landing site in Hawaii), the quirky Old Russian Fort, Spouting Horn blowhole, picturesque Hanalei Bay on the island’s North Shore, Opaeka‘a Falls, the Fern Grotto along the Wailua River, and the frenzy of seabird activity in the cliffs topped by Kilauea Lighthouse. Movie-themed tours take visitors to filming locations seen in Pirates of the Caribbean, Jurassic Park, King Kong, Soul Surfer, and Six Days, Seven Nights. Flights are the only way to travel between Oahu and Kauai. The flight from Honolulu to Lihue is about 45 minutes. Day trips depart in the early morning and last about 15 hours; most tours include lots of scenic driving. Plan for a long day. Kauai’s interior is home to one of the rainiest spots on earth, and weather can vary from one part of the island to the next. Wear layers and bring sunscreen, hat, sunglasses, and raingear. Take time to understand what each tour includes so you’re sure to choose the one that visits the sights you’re most interested in seeing.